Forget what you thought you knew about exploratory testing. Dion Johnson is disturbed by its exploitation by those who wish to escape accountability and forgo up-front planning, but says that exploratory testing and scripted testing can work together to enhance quality practices. One of the most important tools a tester can keep on hand is a book, whether it contains instructions for a new method or is a reference for an old favorite. This Tool Look contains one tester’s take on the book "Fit for Developing Software" by Rick Mugridge and Ward Cunningham. Software development is a creative process that requires communication and nurturing. It's a big surprise to new director of software development Clarion Walker, therefore, to discover that his company’s issues may be rooted in poor team management. Testers are quick to think about speed when testing, but there are many other time-related guidewords that can help broaden your test coverage as well. Michael Bolton suggests a few guidewords to get you started. Tod Golding is all for increased speed and saving time, but not if they compromise the maintainability of your code. The speediest code won't mean much down the road, if someone unfamiliar with the code isn't able to drop in and make an important change or fix. From the Copernican solar system to an engineer’s scale replica of a bridge, the world is full of models that answer our questions and help us solve problems. Lee Copeland tells us that a model doesn't have to be correct to be useful. Every software professional knows that testing is hard, and the situation is even bleaker for software developers. The good news is that effective techniques exist that won't break the schedule or overwhelm developers with test cases. Let loose your inner tester with patterns designed with developers in mind. Agile methods have made their way to the software mainstream in the last few years. As more organizations turn to agile development, its definition often gets obscured. Learn the facts behind five common agile myths, as Robert Holler attempts to dispel these misconceptions. 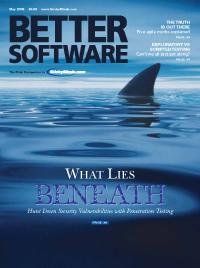 Just when you think your application is free of defects, you find security vulnerabilities lurking beneath the surface. Penetration testing can help you get them before they get you. Ryan English discusses vulnerabilities and offers five steps to organizations looking to start a Web application security initiative.